This post is sponsored in conjunction with AppleWeek. I recieved product samples from sponsor companies to aid in the creation of AppleWeek recipes. All opinions are my own. Who's ready for day 2 of awesome recipes? Nordic Ware sent me this beautiful quiche and tart pan, and my wheels started spining right away. I thought about doing a rolled out gingerbread cookie dough, but I still haven't gotten really confident with pie crust yet. I did like the idea of pairing ginger with the apples, so I decided on gingersnap cookies. You can make them from scratch if you want, but I used store bought. I ran them through the food processor, added a bit of sugar and some butter. It pressed into the pan so easily with a glass. The next debate was to bake or not to bake? I decided to bake it. But what to fill it with? I wanted to use the Gourmet Pure Vanilla extract that Rodelle sent in a way that really showcased the flavor, and what better way to do that than pasty cream? I used the classic recipe, but upped the amount of vanilla from 2 teaspoons to 1 tablespoon. And you can't have an AppleWeek tart without apples! I kept those simple, sauteeing thin slices in a combination of butter, brown sugar, vanilla and water. I wanted to lay them out in a pretty presentation on top of the pastry cream. You can do diced instead, it will just take a little longer for them to cook through. I hope you are enjoying all the recipes so far, I know that I've already found several things I can't wait to try! Don't forget to enter the giveaway below for your chance to win prize packages from NordicWare, Rodelle and our other amazing sponsors. Info on the prize packages can be found here. Heat oven to 375. Combine gingersnap crumbs, sugar and butter in a bowl until well mixed. Press into tart pan, on bottom and about 2" up the sides. I like to use the bottom of a glass. Bake for 8 to 10 minutes. Place on wire rack and let cool completely. In a medium saucepan, combine milk, vanilla and 1/4c sugar. Heat on medium high heat until bubbles form around the edge. Combine egg yolks and 1T sugar. Sprinkle in cornstarch and flour and beat until well mixed. Pour half of the milk into the egg mixture, whisking briskly. Pour all of the combined mixture into the saucepan. Bring to a boil, whisking constantly. Whisk in butter. Pour into a bowl and refrigerate. In a large bowl, toss together apple slices, cinnamon, and sugar. Over medium heat, melt butter in a skillet. Add vanilla and water, stir. Add the apples. Cook, stirring gently for about 8 to 10 minutes, until the apples are soft, but still hold together. Cool completely. To assemble tart, pour pastry cream into gingersnap shell. Top with apples. Enjoy. Store remaining tart in the refrigerator. Ginger & apples...the perfect combo!!! Your tart looks beautiful! 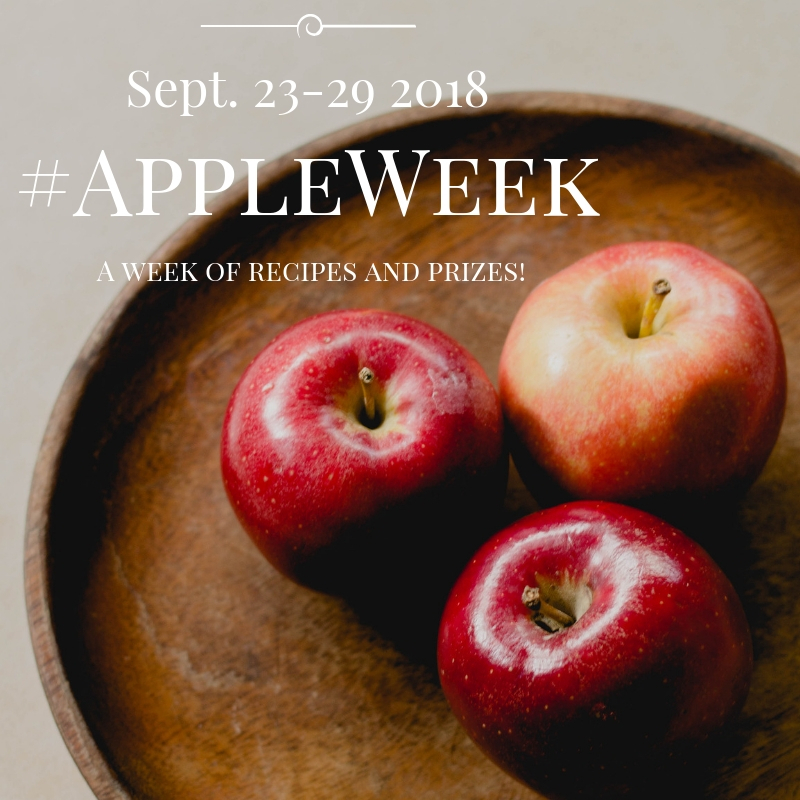 Happy Apple Week! 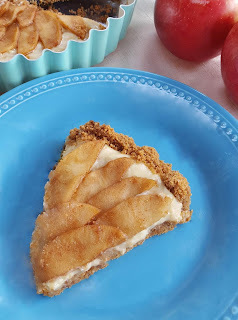 Such a pretty tart - and I love the gingersnap crust. So fun! This sounds delicious and I love that pan. What a beautiful tart and that pan is so pretty too. Yum!